I've been experimenting with an Arduino Uno (pictured below) for the past few days. 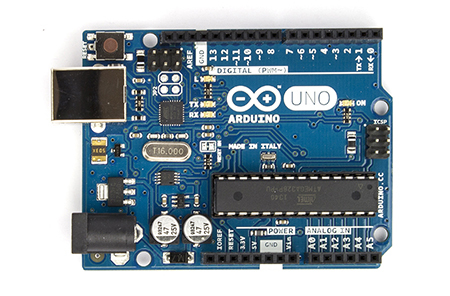 The Arduino is a microprocessor development board based on the ATmega 328 chip. Today I'll show how to create a voice-controlled TV remote using the Arduino interfaced with a simple program written in C#. Front of an Arduino Uno development board. Available from various distributions; I recommend AdaFruit. Available from various; I used the Radioshack 276-640 (which does not look like it does in the picture), but there are many pin-compatible replacements. For example the GP1UX311QS from AdaFruit or Digikey. I used a RadioShack 276-0143, but any will do. 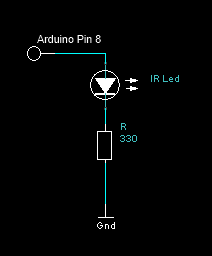 To reverse engineer the IR codes, I used a modified version of the circuit and Arduino sketch ("Arduino program") available at LadyAda's tutorial on IR sensors. Source code for my modified version is available at this link. IR communication is very simple and occurs by sending a pattern of pulse sequences. The IR LED is either in the state OFF or PULSED. When it is OFF, the IR LED is simply powered down. When it is PULSED, the IR LED is being rapidly switched on and off at 38 kHz. The duration of PULSED and OFF states defines a command. For example, all the commands used by my Toshiba remote start with: PULSED for 8620 [us], then OFF for 4240 [us], then PULSED for 600 [us], then OFF for 580 [us], then PULSED for 480 [us], ..., etc. To determine the needed IR pulse sequences, I picked up my TV's remote and pointed it at the IR receiver on my breadboard. Pushing the button causes the Arduino to report the pulse sequence measured via Serial communication. Using the Serial Monitor, I pushed each button 10 times and averaged the pulse squence durations to obtain an average code. I measured the codes for the numeric keys (0-9), Power, Mute, Closed Captions (CC) and Sleep. 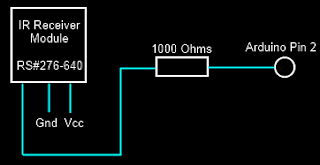 The circuit to pulse the IR LED is quite simple. Simply wire the positive (+) terminal of the IR LED to Pin 8 of the Arduino and the negative (-) terminal to a 330 Ohm resistor running to ground (see schematic below). With the IR LED I used, with a forward voltage of 1.2 [V] and a rated current of 100 [mA], this requires a 11.5 [mA] draw from the Arduino pin (10x less than the rated IR LED voltage). This limits the communication range to about 1-2 feet. A better solution would probably be to control a larger amount of current with MOSFET transistor gated from the Arduino. As I mentioned, IR communication occurs by sending a specific pattern of pulse sequences. From my reverse engineering, I determined that each of the sequences had 69 PULSED or OFF states in their sequence. (The encoding may vary in your system). Since space is a little limited on the Arduino board, I used a tricky bit of encoding. I noticed that the first 35 states and the last 7 states always have the same pattern no matter what button is pressed. In this case, the differences between different buttons occurred only at 29 of the middle durations and in every case it led to a pulse 1080 [us] longer. These can be efficiently encoded in an 32-bit integer (uint32_t) with each bit corresponding to one of the middle pulses (state 36 through 64). If the pulse is 1080 [us] longer than the minimal length, the bit is set to 1; otherwise to zero. The "consensus" code (corresponding to the minimal duration observed at each of the 69 states) is hard coded into memory and 1080 [us] is added to the state duration if the bit at the (i-35)th position in the encoding integer is 1. // doing it in the time-critical loop. During development, I found that occasionally the recognition engine responded to background noise or speech not directed to the system, so I also enabled a "Pause Recognition" and "Resume Recognition" to toggle the system into/out of a waiting state. To support the channels I commonly watch, I downloaded the list of TV channels for my area from my provider's website and parsed them into the channelNameChoices table (see the loadNetworks method). I found it was helpful to also include audio feedback for the Pause Recognition and Resume Recognition commands. For other commands ("tune network to [...]") there is the feedback of the TV doing what I ordered it to do, but for the pause/resume commands there is only a single internal state transition. It's nice to have the audio confirmation that those command were implemented. I used the SpeechSynthesizer (in the System.Speech.Synthesis namespace) to give a brief confirmation message when those commands were understood by the recognition engine. *The Arduino port may vary by system (many others report COM4). Check Device Manager to be sure. As a microphone source, I used a very old Logitech QuickCam Zoom (a desk-mounted webcam). Acceptable speech recognition performance was achieved with this set-up. A headset mic would probably yield better performance, but would be less portable (I like entering my study and being able to simply say "Toggle Mute" to take Fox News or CNN off of mute without needing to put on a headset mic). However, due to the limited vocabulary and simple syntax of the recognition grammar, recognition quality was usually quite good. Sorry! So, they asked to say thank you as they used few of your tips while working with online data room services . Waiting for some your new posts!